This profile of Billie Holiday is presented in three chapters covering the 1930s, ‘40s and ‘50s respectively. She’s quoted from interviews and her famed autobiography, Lady Sings the Blues. Representative recordings, podcast clips and readings add detail and perspective to each decade of her compelling story. It’s notable that photographs of Billie’s mercurial visage are constantly shifting, never the same twice. 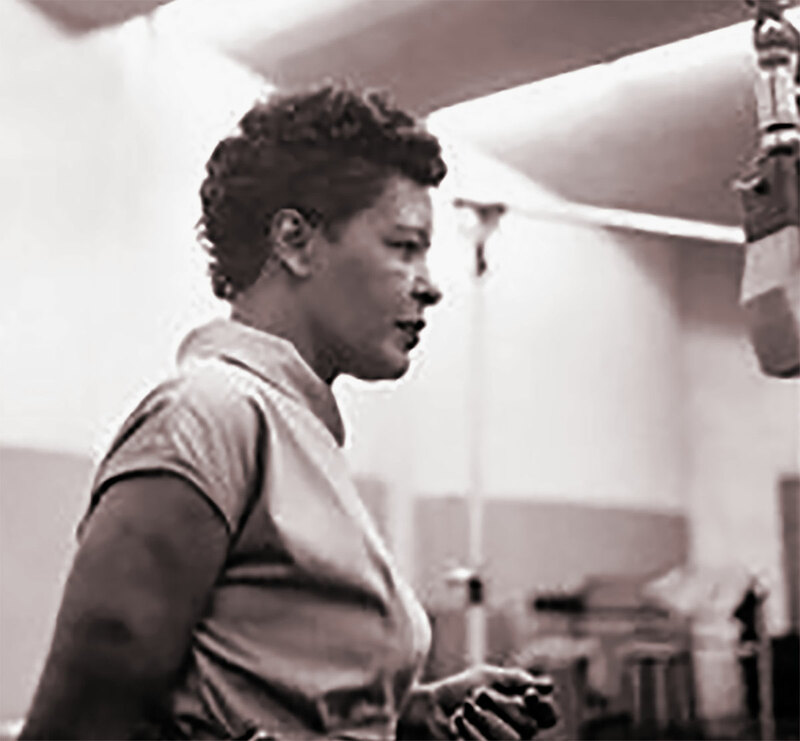 During the 1950s Billie Holiday (Eleanora Fagan, 1915-59) continued a busy schedule of recordings, concerts, radio broadcasts and television appearances. 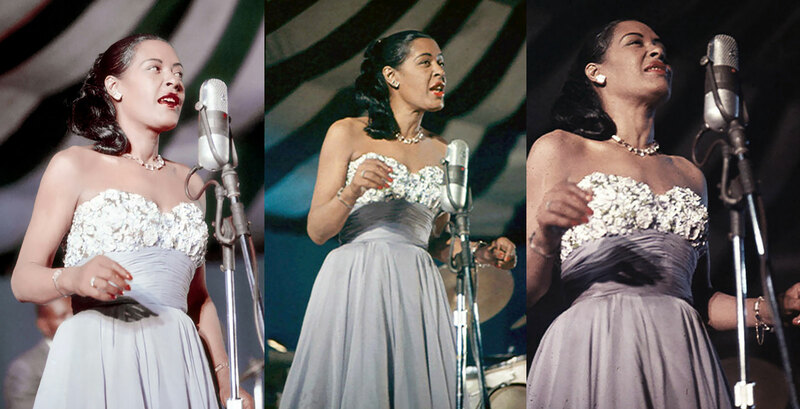 In 1954 she performed to great acclaim in London. The high-profile publication of her sensational memoir in 1956 kept her in the public eye. 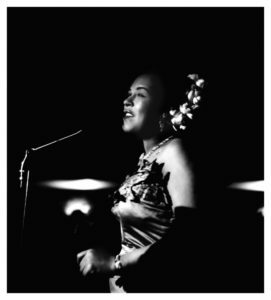 Billie returned to singing popular ballads and lighter material — even some Rhythm and Blues — continuing to show extraordinary gifts as a singer. 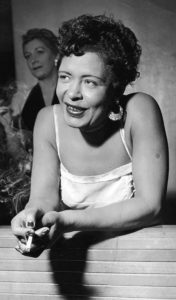 Despite her arrests, disordered personal life and addiction, she was a tough survivor who still “had it” and was one of the best jazz singers of all time. At the Tiffany Club, Los Angeles, 1951. Concert producer, record label owner and jazz promoter, Norman Granz (1918-2001) may have been the most successful impresario in the history of jazz. During the 1950s he was a major patron and benefactor for Holiday. 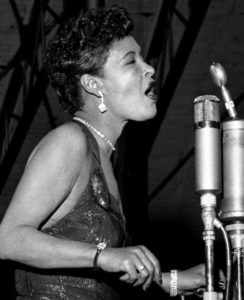 She was presented via his concert series, Jazz at the Philharmonic and well recorded on his Clef and Verve labels with excellent talent like Sweets Edison (trumpet), Benny Carter (alto sax), Ben Webster (tenor sax) and a favorite piano player of hers, Jimmy Rowles. Granz helped sponsor Billie’s first overseas tours of Britain and Germany. She was in excellent form in England where she dazzled Londoners and charmed her hosts. At prestigious Albert Hall she sang 15 songs for an audience of 6,000. Billie was among several notorious celebrity heroin addicts of the era like jazz musician like Charlie Parker, English artist Francis Bacon, comedian Lenny Bruce or writer William S. Burroughs whose scandalous novel Naked Lunch celebrated the junkie life. The lurid details of their arrests and overdoses were widely publicized, drawing morbid fascination. In 1956 came yet another arrest and more scandal. She insisted that the cops framed her. Yet heroin, cocaine, opium and alcohol had damaged her. Billie’s voice had lost flexibility and richness. It was often thin and stressed – like her body. In jam sessions and concerts on television or radio Holiday was occasionally reunited with former comrades like trumpet player Buck Clayton and saxophonists Coleman Hawkins or Lester Young. But her voice had become threadbare, its range limited. Her fragility was undeniable, mood somber.